Riyadh, Gulf Intelligence – A rigorous and comprehensive personnel strategy is the most important aspect to digital transformation being successful, according to Michael Train, President of Emerson & Chairman of Emerson Automation Solutions, speaking at the inaugural Gulf Intelligence Saudi Arabia Energy Forum in Riyadh last week. “If you are not focused on people as much as you are on technology, your digital transformation will stall and ultimately fail to materialize. There has to be an effective collaboration between IT and OT to design and manage this transformation. Education and upskilling of the workforce to adapt their work, based on new technologies and data, is also crucial and this applies at all levels, including preparing the next generation through universities and trade schools and making industrial manufacturing a desirable career path,” said Train. Other critical components to successful digital transformation include having a clear and defined business case for the adoption of new tools such as machine learning and AI, according to Emerson. This not only justifies the investment but also provides a means of measuring progress. In addition, taking a practical and scalable approach to using new technology is important to be able to manage expectations, budgets, and performance. Emerson is a global leader in technology and engineering focused on providing innovative solutions in industrial, commercial and residential markets. 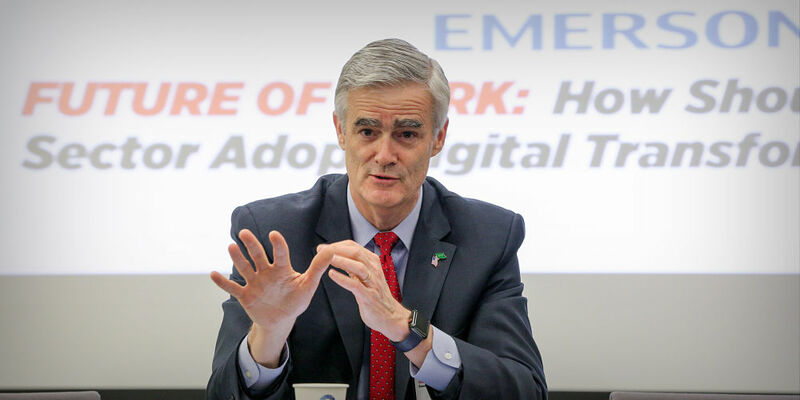 Emerson has been present in Saudi Arabia for 25 years and manages its operations out of the Dhahran Techno Valley, also home to the company’s Collaboration Centre, a facility dedicated to driving innovation and co-creation with end users and educational facilities. The Gulf Intelligence Saudi Arabia Energy Forum, at which Emerson was Title Partner and which was held under the patronage of His Excellency Khalid Al Falih, Minister of Energy, Industry and Mineral Resources, Saudi Arabia, gathered some 400 stakeholders engaged in the Saudi energy, industry and mining sectors to exchange knowledge on how the megatrends emanating from the ‘Industrial Revolution 4.0’ could impact the energy sector, and to brainstorm on how best to adapt to these challenges and opportunities.